Michael Pedersen spoke about athlete and fan engagement in the fight against climate change at 2018 European Union Sport Forum. The Forum took place in Sofia, Bulgaria on 22-23 March 2018. It brought together approx. 300 participants from across Europe, representing a range of stakeholders in and around sport. In the context of the session titled “Sport and Climate Change: How Can Sport Contribute to the Paris Agreement”, Michael shared insights and perspectives from a global project that he is leading. The project aims at motivating and enabling particularly passionate and credible athletes from across sports, countries and regions to effectively advocate individual behavioural change among their fans in support of the fight against climate change. 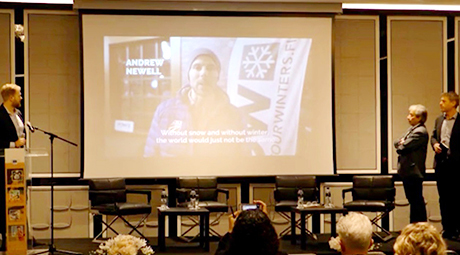 Under the umbrella of Global Crisis Information Network, a pilot project was carried out in the context of 2017 FIS Nordic World Ski Championships in Finland. Five additional pilot projects are expected to be carried out over the course of the next year – in the context of world championships in different sports. 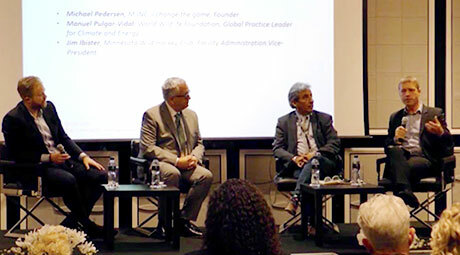 Among other points, Michael Pedersen emphasized the importance of educating (very focused and often very young) athletes about their unique power in motivating fans, which cuts across traditional societal dividing lines at a time with unprecedented low levels of trust in government, business and civil society. He also stressed that engagement in positively addressing societal challenges like climate change offers great value to many athletes. First of all, such engagement offers an opportunity for athletes to broaden and deepen their fan engagement – and so their value to sponsors. Furthermore, it offers an opportunity for athletes to start developing skills, experience, expertise and network to pursue a post-athletic career in the sport for development sector. Michael also shared how fan testing is an important part of the project, i.e. collecting data to find out what kind of athlete messaging that resonates the most with fans in particular sports, countries and regions. This data will be an important tool to support athletes in effectively motivating individual behavioural change among their fans in support of the fight against climate change. Closely related, Michael Pedersen emphasized that it is not for all athletes to become engaged in the fight against climate change in the context of the project that he is leading. First of all, some athletes are more passionate about climate change than other societal challenges. Furthermore, athletes engaging need to be able and willing to show the individual change that they are advocating vis-à-vis their fans (often unlike advocacy related to other societal challenges). For instance, a lavish life-style with private jets and big cars will substantially diminish the credibility of an athlete as a climate change advocate, as perceived by fans. In his concluding remarks, Michael recognized the leadership of UNFCCC in currently hosting a sport and climate action dialogue. This dialogue, in the context of which he is co-chairing one of the work streams, is expected to be concluded with the launch of a specific sport initiative in the context of COP24 in Poland at the end of the year. Manuel Pulgar-Vidal, Global Practice Leader for Climate and Energy, World Wildlife Foundation (WWF); former Peruvian Minister of the Environment and COP20 Chair. Jim Ibister, Vice President, Minnesota Wild Hockey Club.